Toshiba's new Satellite Radius 15 is an update to last year's laptop of the same name, adding an aluminium enclosure, Windows 10-specific keyboard shortcuts and a pixel-packed 15.6-inch 4K display. It's a step up in every way from its predecessor, which had a less impressive Full HD screen (although a Full HD version is once again being offered). The way you use it hasn't changed, however; the display can still be flipped into five different positions depending on how you want to interact with the screen's contents. The new Satellite Radius 15 is a hair or two thicker and slightly heavier than last year's model, which is perhaps unsurprising due to its superior build quality and the switch from plastic to aluminium construction. It tips the scales at 4.96 pounds, compared to last year's weight of 4.8 pounds. It's a tad thicker too, measuring 0.79 inches thick compared to last year's 0.75 inches. It's better looking though, sporting squarer corners and sharper angles, making it bear a much closer resemblance to HP's Spectre x360. The Satellite Radius 15 is due to ship with Windows 8.1 when it lands in July, but it's Windows 10-ready thanks to a number of OS-specific keyboard shortcuts, including one that brings up Microsoft's voice-activated personal assistant, Cortana. Though, as has been the case in the UK for some time, she failed to materialise on our pre-production test unit due to not yet being available outside of the US. While being able to flip the notebook into different positions could be useful for propping it up to steam a movie or online TV, it's still fairly cumbersome when held in tablet mode. You're not going to want to use it as a tablet all of the time due to its weight alone, but at least the option is there. The Satellite Radius 15's 4K display is expectantly sharp, producing smooth lines all over the screen while rendering text crisp and legible. It's bright too, and did an excellent job of making the leafy desktop wallpaper appear vibrant with bold colours that "popped". Being a 4K panel, you have the choice of multiple scaling settings to make text and desktop contents smaller or bigger, depending on how good your eyesight is. Our hands-on unit was set to 250%, which made everything look crystal clear without reducing space on the desktop too much. The Radius is also available with a 1080p display which brings down the cost of entry. Toshiba has equipped the Radius with a pair of built-in Harman Kardon stereo speakers. They're suitable beefy, which Toshiba claims is due to a partnership that was struck between DTS Sound and Slipstreamport to help produce a rich, precise tone at max volume without distortion. On the inside, you're given the choice between Intel Broadwell processors or AMD APUs, and storage options include a 750GB hard drive or a 512GB SSD, along with up to 12GB of main memory. 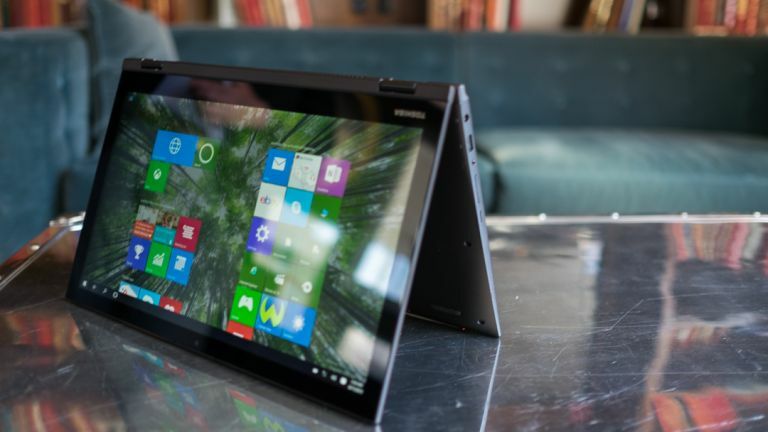 Starting at £599 for the Full HD version (pricing for the 4K version is yet to be revealed, but expect it to be quite a chunk more), the Toshiba Satellite Radius 15 is shaping up to be a solid offering and one that ticks a number of boxes if you seek an attractive, well-built and highly configurable notebook that happens to be flexible too.